engineering makes the difference between a good street rod or muscle car and a great one. Whether it’s the chassis fabrication, the assembly area, the office, or the body shop, our staff have one thing in common... We are car people! 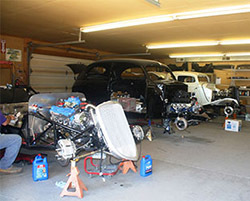 The Heinzman Street Rod Shop has been owned and operated since 1985 under the expert eye of John Heinzman, who oversees a staff of craftsman dedicated to building the finest hand-built street rods for his customers. Thirty plus years of experience makes the deference between knowing what works and what doesn’t. That experience also carries over to the parts we sell in our catalog. We use the parts in this catalog when building customer cars, so we know how a part works and can answer any question you have about a part we sell. experience to bring together a strong and safe vehicle. One that looks right, drives right, and runs right. Anyone who knows street rods knows that mistakes are expensive. At the Heinzman Street Rod Shop, we know how to put together the right combination the first time. 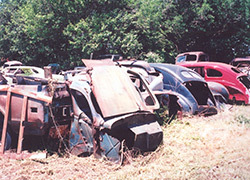 Our experience can make the best of your investment without compromising safety through inferior parts or workmanship. 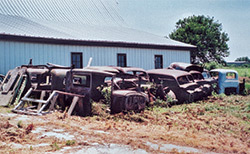 The Heinzman Street Rod Shop is located under the wide Nebraska skies about 90 miles and a 1.5 hour drive from Lincoln, NE. The nearest airport is in Grand Island, NE and is about a ten minute drive from the shop. We always have a great selection of vintage tin around too.